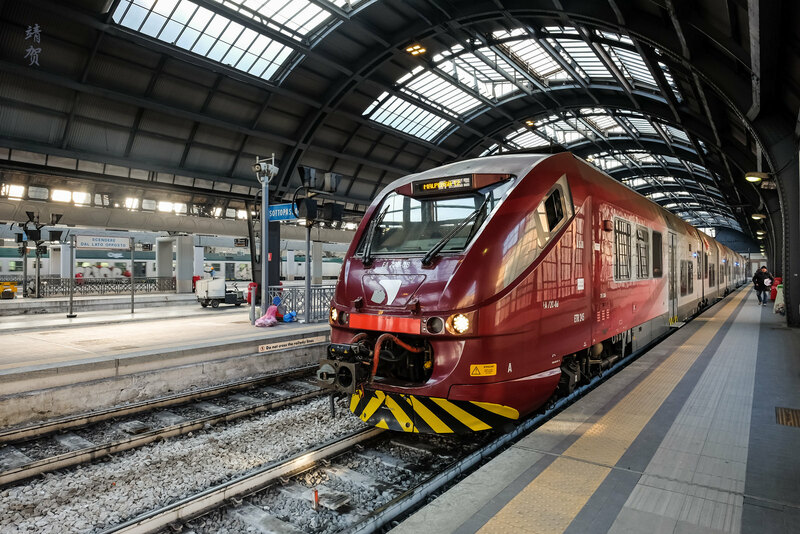 To get to the airport for my departing flight, I boarded the Malpensa Express train from Milano Centrale station and arrived at the airport in around 50 minutes at 11:20am. Surprisingly the tax refund situation here was quick and painless and I was able to proceed to an empty check-in area for Thai Airways. There was no queue in Royal Silk Class since I believe most of the passengers have actually checked in for the flight. As I had no elite status with Thai or on any Star Alliance airlines, my luggage allowance was only 40 kg in Business Class. Check-in was quick and I obtained both my boarding passed to Bangkok and for the connecting flight to Jakarta. 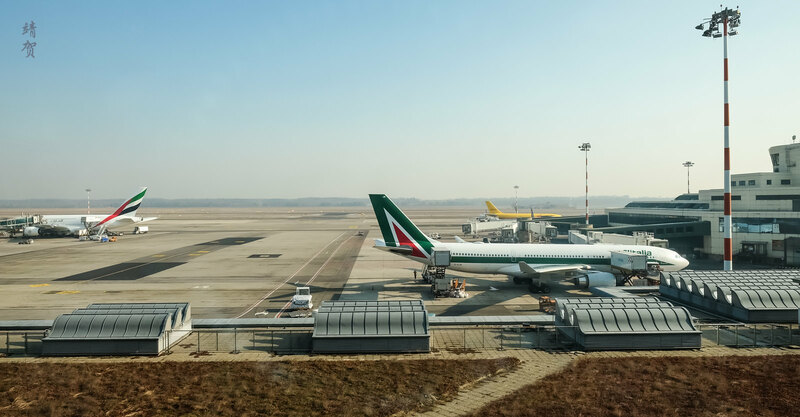 There was also a fast track pass for premium passengers but it was unnecessary as there was very little passengers passing through Milan this morning. 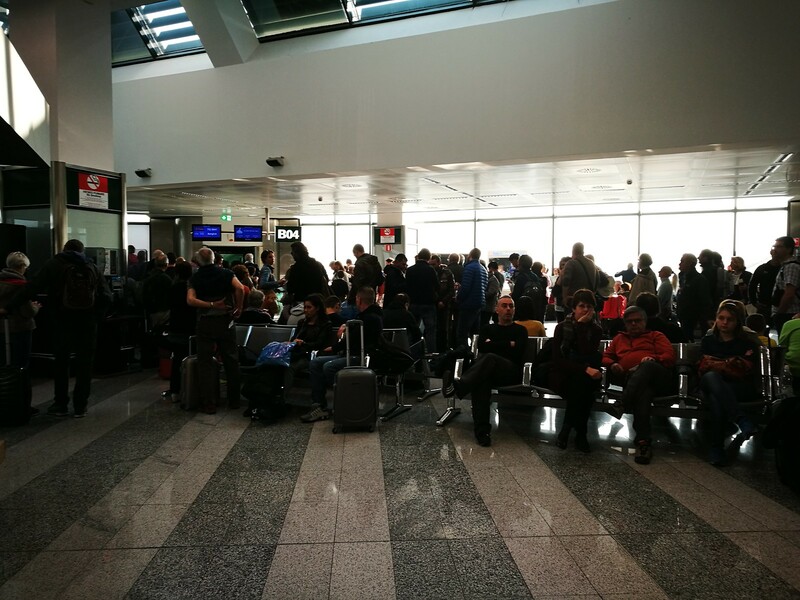 However there was no communication on how far the boarding gates and lounge would be. Tuns out it was a long roundabout walk around the duty free and towards passport control before arriving at the lounges and boarding gate. 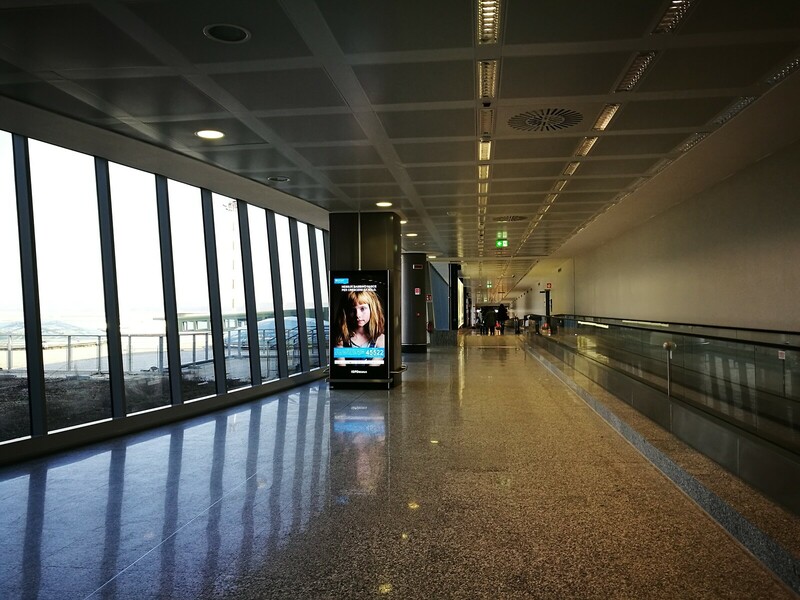 Disliked Milan airport for this convoluted layout since there was a lot of walking involved. 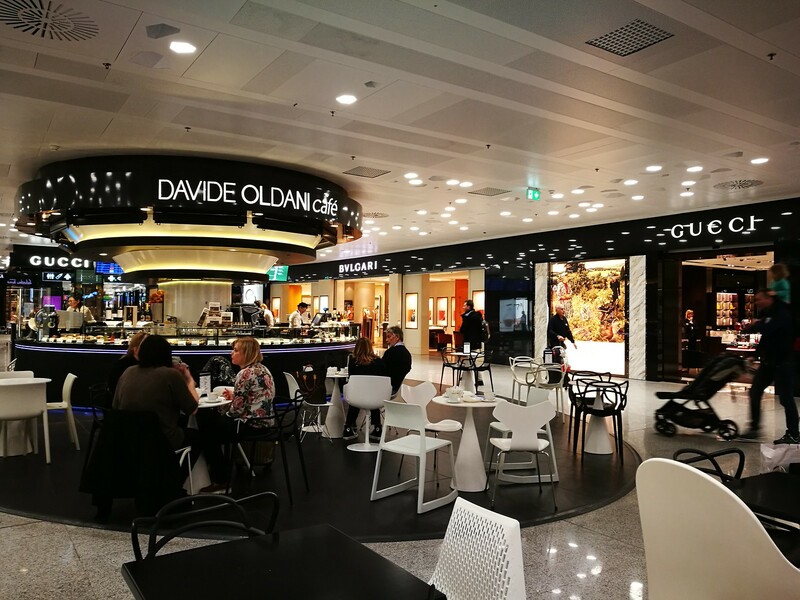 As a result, I did not have the time to check out the lounge which I did not notice along the way and it was already 5 mins past the indicated boarding time by the time I was at the boarding gates. 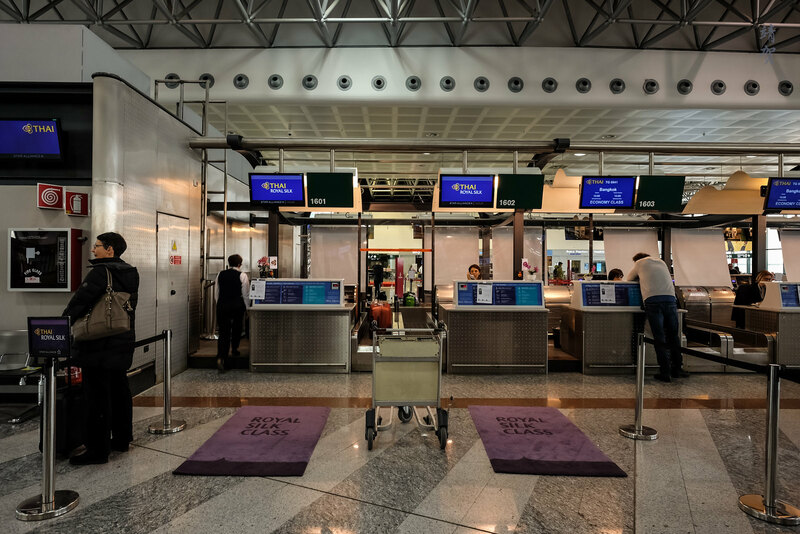 There was a couple of eateries around the gate area where passengers could perhaps get some snack and a drink. 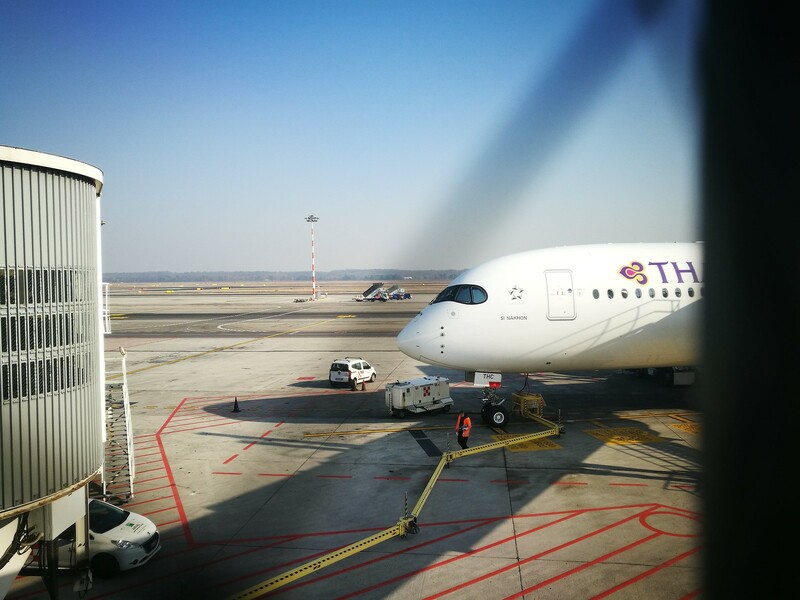 Unfortunately I could not get a nice view of the parked A350 which was a pity since Thai has a nice livery and the A350 is probably the nicest plane out there. As usual some passengers just refuse to listen and board with Business class that was called first. I queued up behind the priority line and managed to get a decent head shot of the plane from the bridge with a view of ‘Si Nakhon’ that would fly me back to Asia. Welcomed onboard by two female stewardess today but the business cabin seems to be staffed by the stewards today. 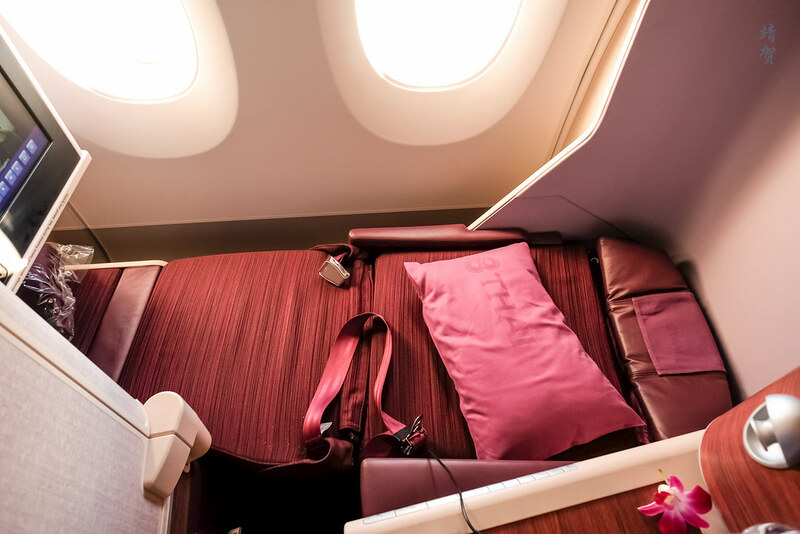 Thai opted for the staggered Business Class layout which offers guests lie-flat seats in a 1-2-1 abreast configuration. 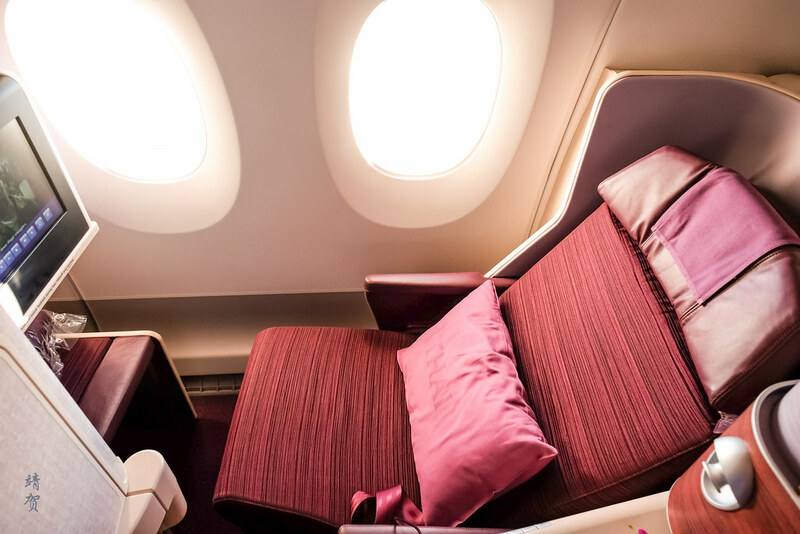 These seats are versatile since they allow couples to be seated together in the middle and solo travellers can get the most privacy on the window seats, and these seats are 12/15/17/19 A and K. A note from Thai Airways’ seat map of the A350-900 shows that seat 19K is also the location of the medical outlet and thus passengers might be disturbed in a medical emergency. There was a comforter, a pair of slippers and the amenity kit on the foot rest. 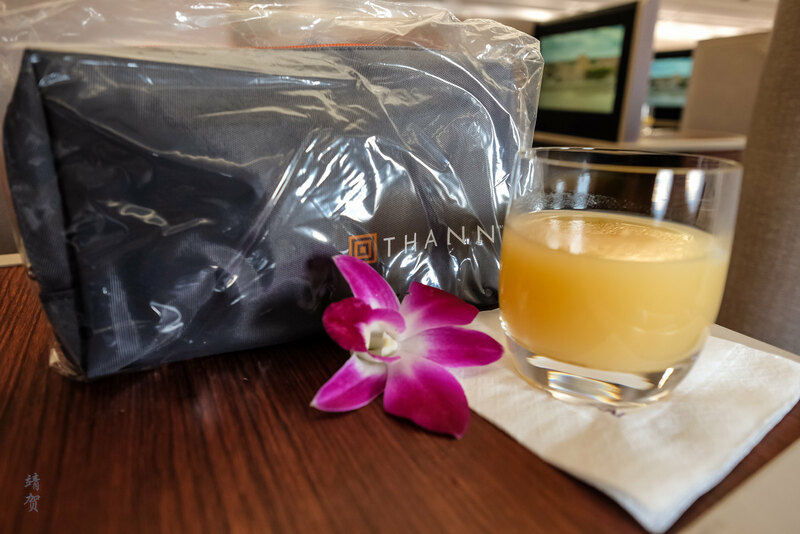 Thai has one of the most complete amenity kit for a Business Class cabin though the case is quite flimsy with contents now being provided by Thann – a Thailand-based cosmetics and wellness company. 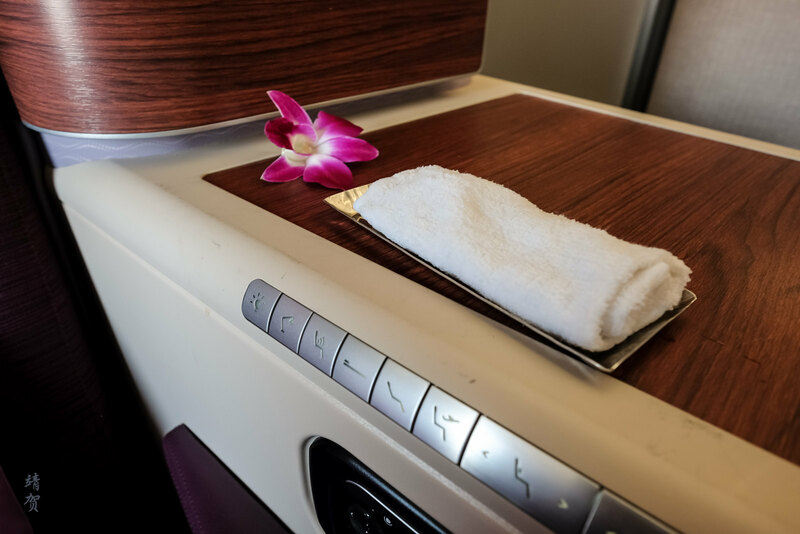 An orchid can be found by the large console on my left and this is a signature of Thai’s Royal Orchid service. 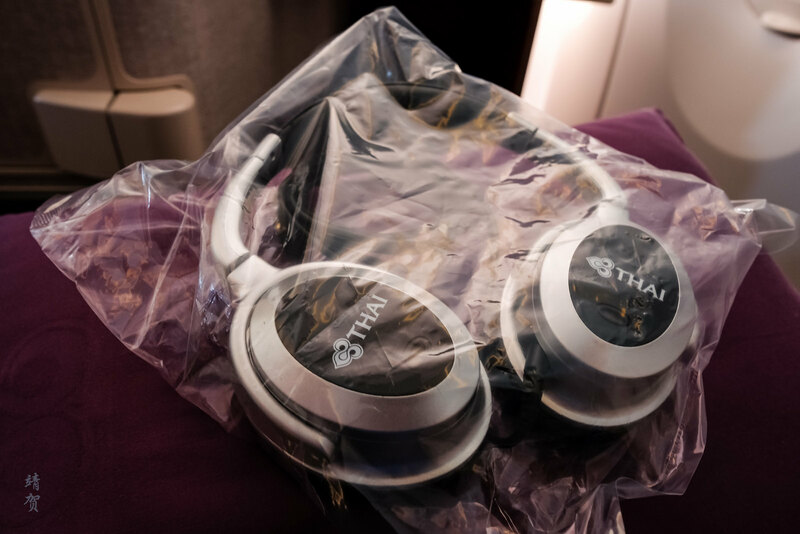 Headphones can also be found on the side compartment of the seat, though they seem to be the generic version that was branded with Thai’s logo. They were comfortable enough to use but a far cry from any high end headphones one could possibly get in the market today. 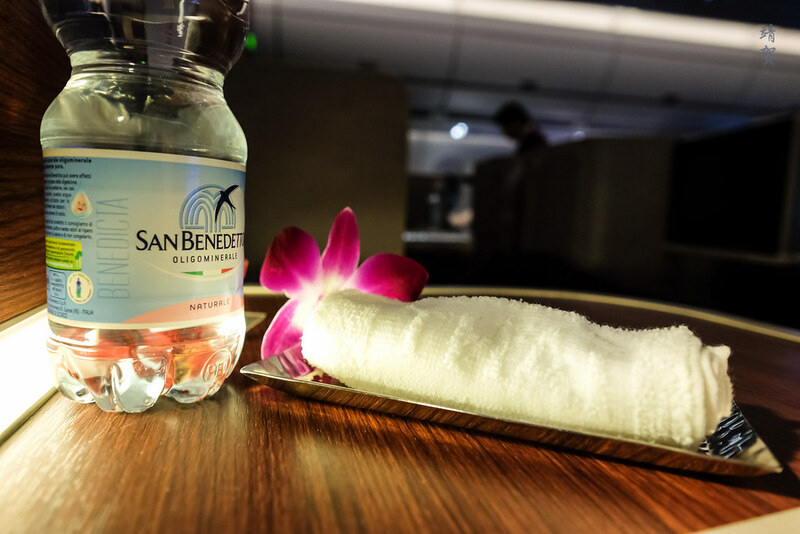 A hot towel was left beside my seat while the steward welcomed me by name and enquired what I wanted to drink. 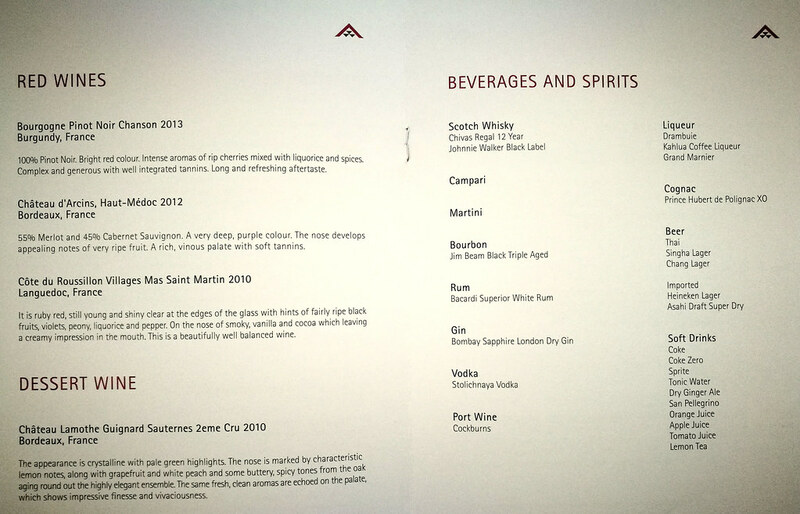 Welcome drinks includes a choice of water, juices or champagne. I picked the apple juice. 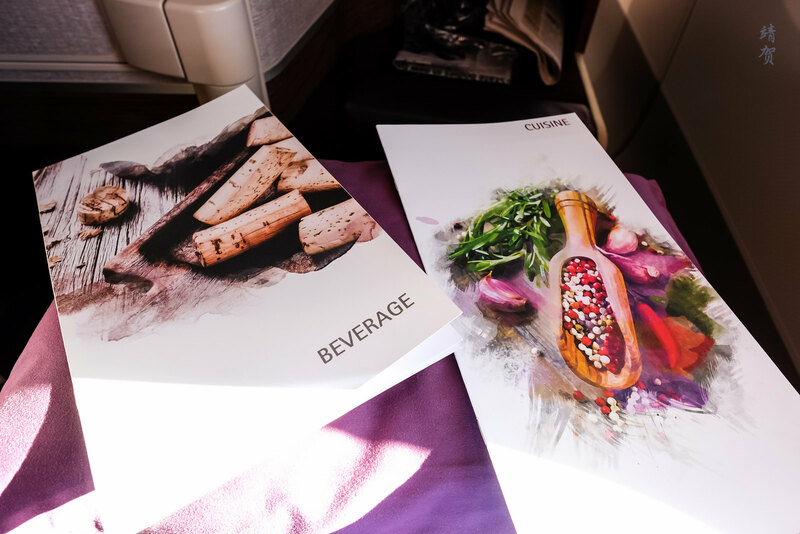 Menus for the flight was then distributed around the cabin. Safety video was played after a normal boarding process that was reasonable quick. Flight loads seems high with Business class being full and that was one of the reasons I could not pick other window seats. As for the seats itself, I found it very comfortable and I like the front facing seats. The large console on my left provides a good space to store items during boarding. 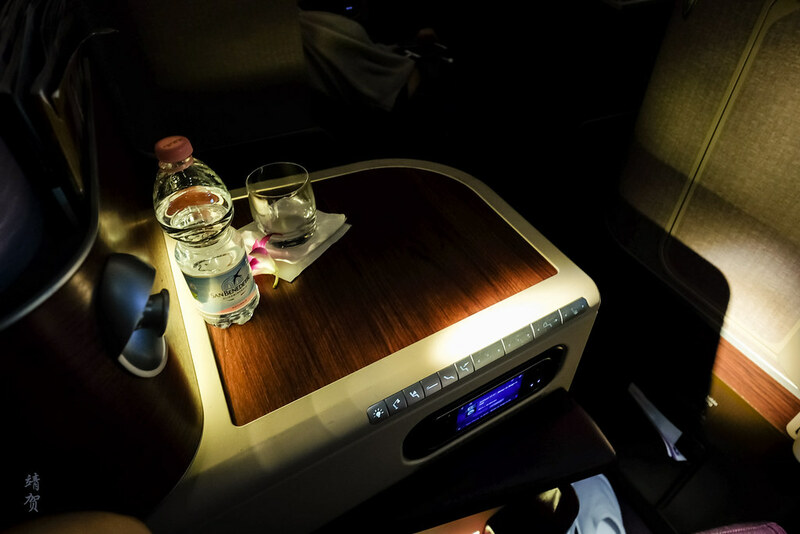 On the edge of the console, there is a row of buttons to control the lights and seat positions with preset seat settings for take-off, sleeping and relaxing. 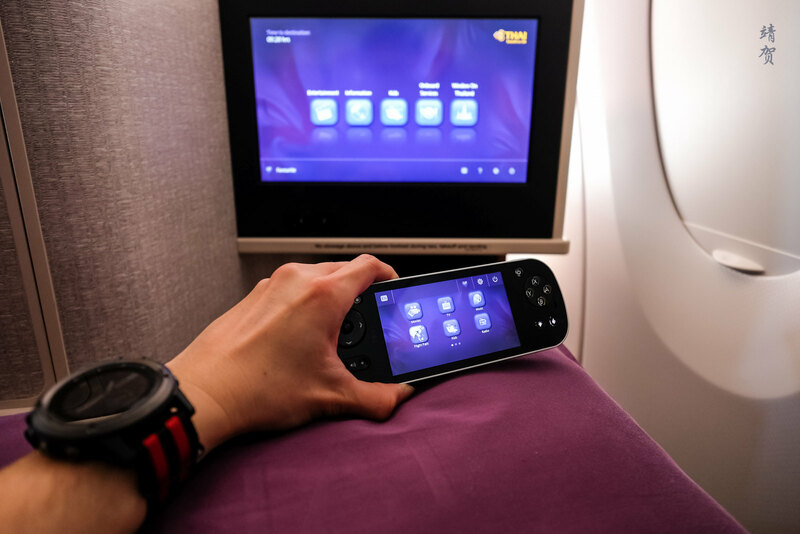 Control for the inflight entertainment is via a larger controller with its own LCD screen. 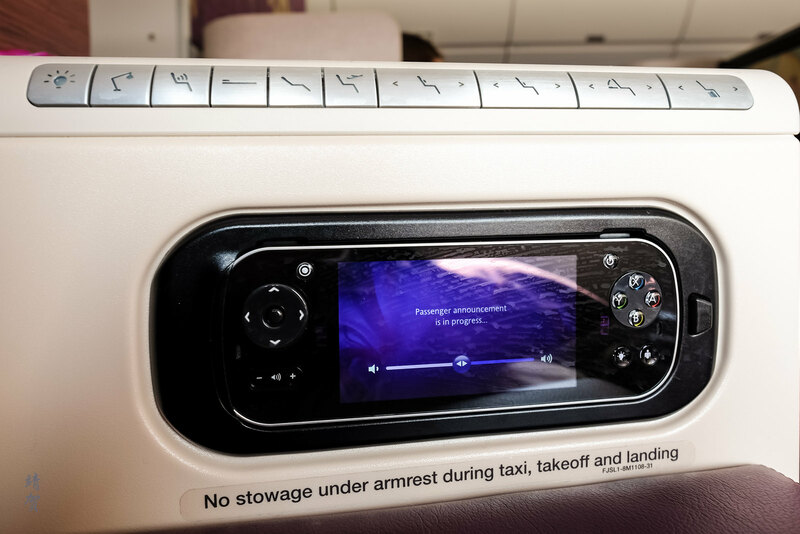 This allows passengers to observe the flight maps while watching a movie on the screen. 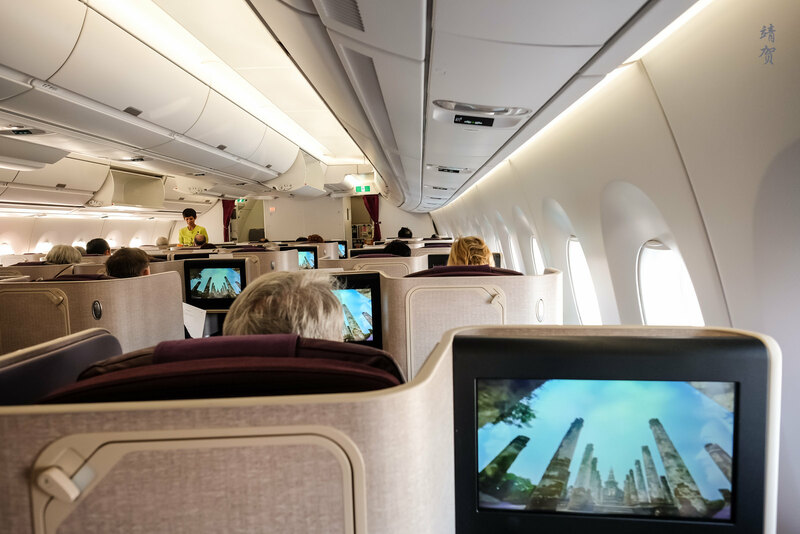 Choices for movies and TV shows onboard Thai is quite good and the interface is easy to navigate. 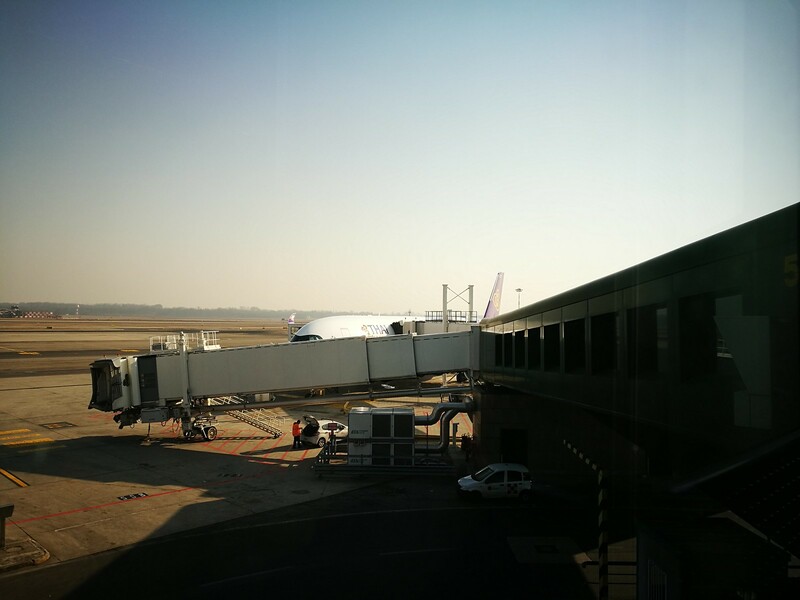 From the gate, it was a short taxi to the runway without much wait for take-off. 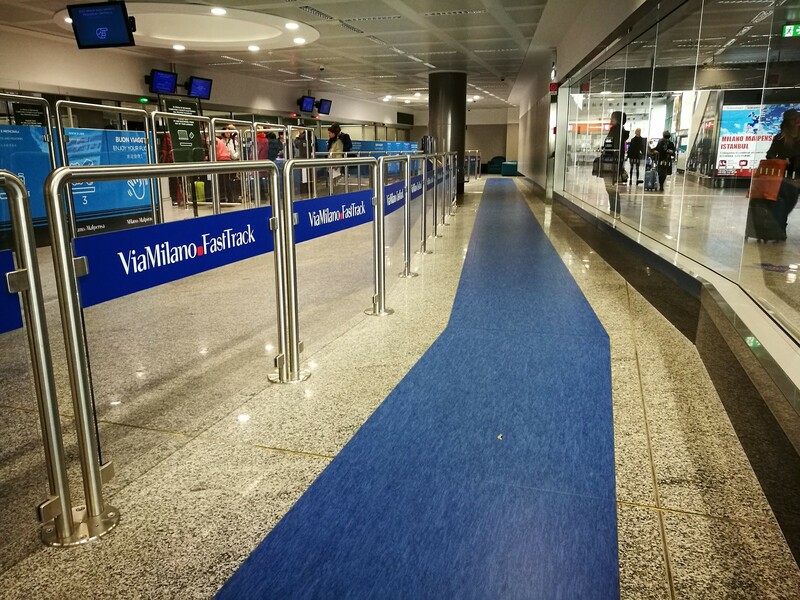 I guess that would be the benefit of flying out of Europe from a less crowded airport like Milan Malpensa. After take-off, the captain advised a shorter flight time with an estimated arrival of 5:15am. 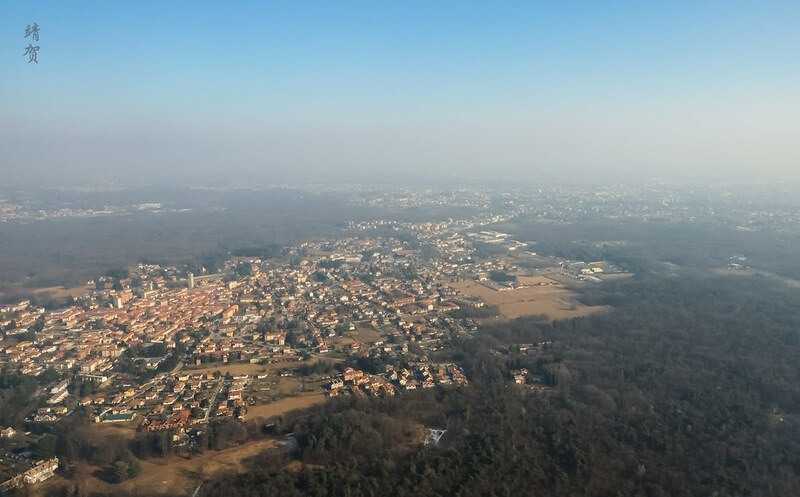 The route was fairly straightforward with an easterly turn right after take-off towards the Adriatic sea. 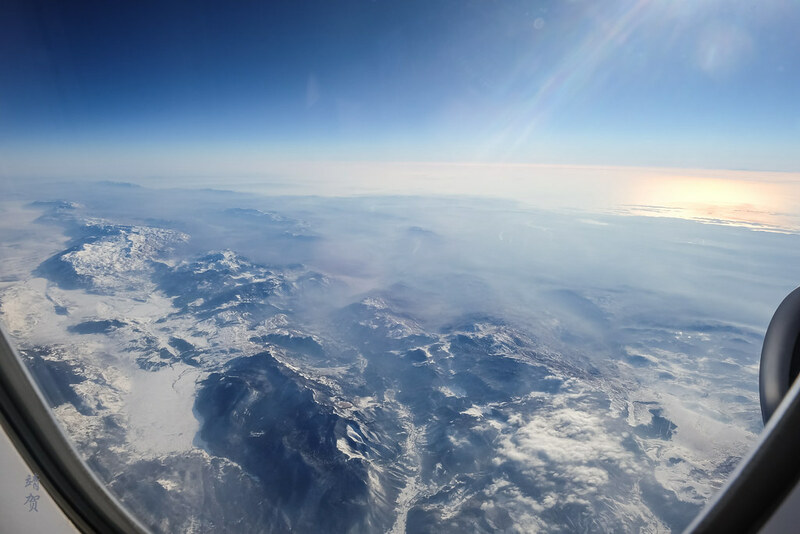 The start of the flight with plenty of light meant I got to enjoy the views from the larger windows of the A350. 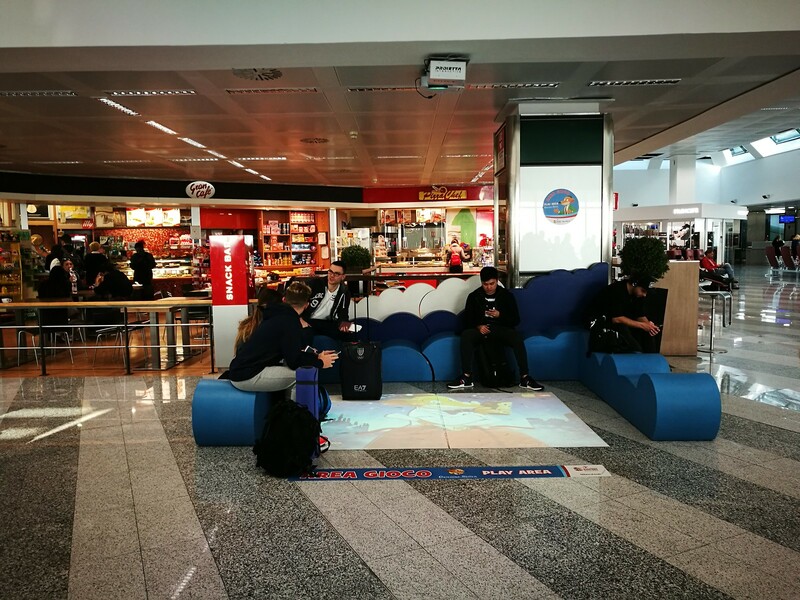 Some of the interesting sights includes the Adriatic sea and the Dinaric Alps of the Baltic states. 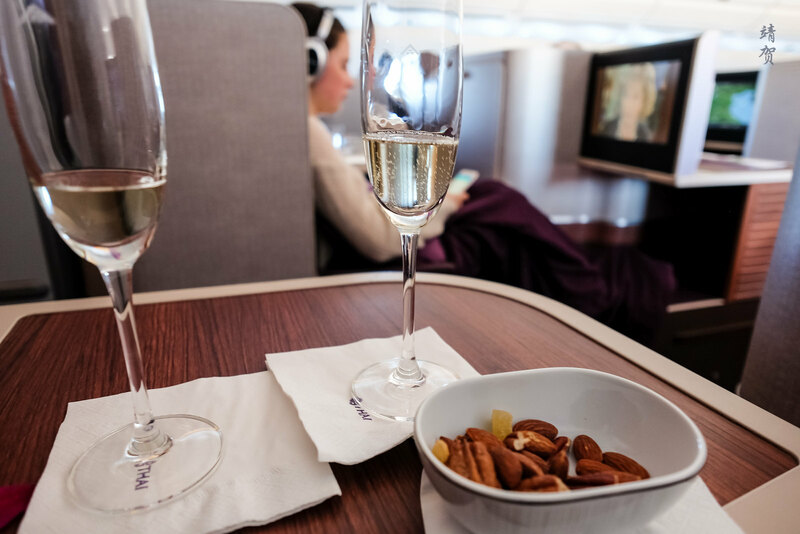 Upon reaching cruising altitude, snacks and another round of drinks was served. 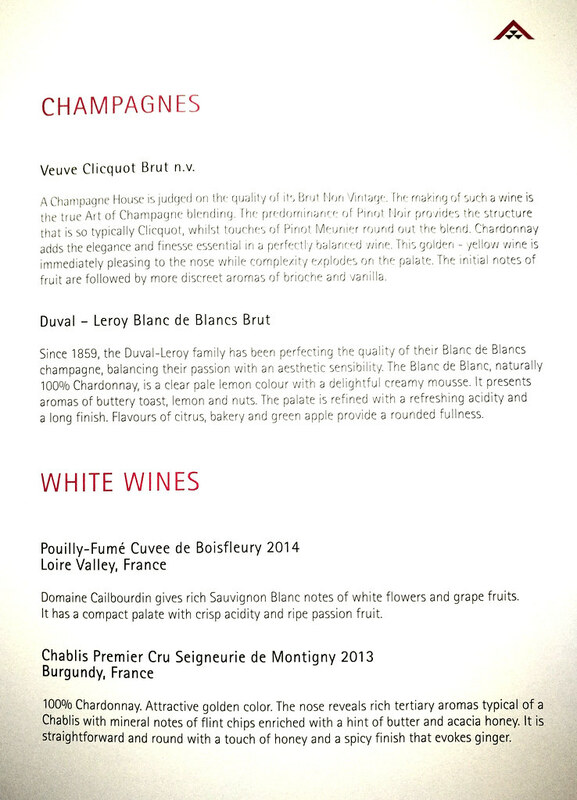 I was able to have a tasting of both champagne as suggested by the steward when I requested the champagne. 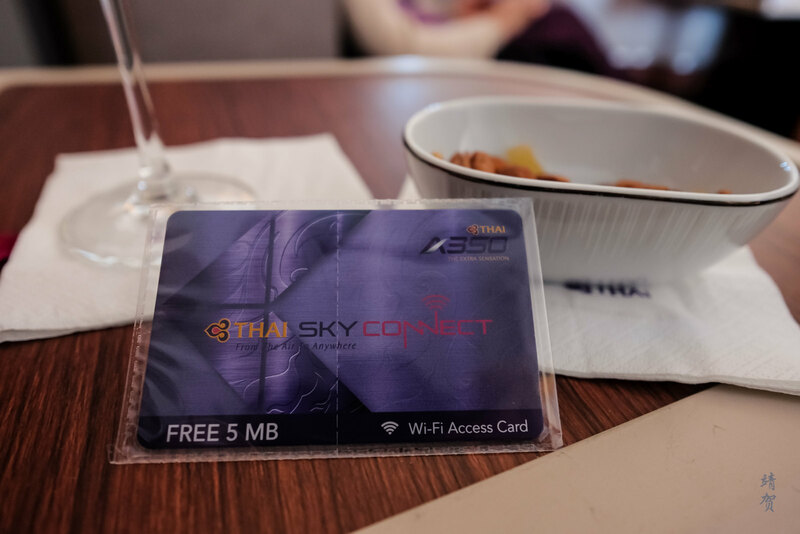 After that another crew member came around to pass an code for free inflight wifi. Though only 5MB was provided and that was perhaps just enough for some Whatsapp messaging. 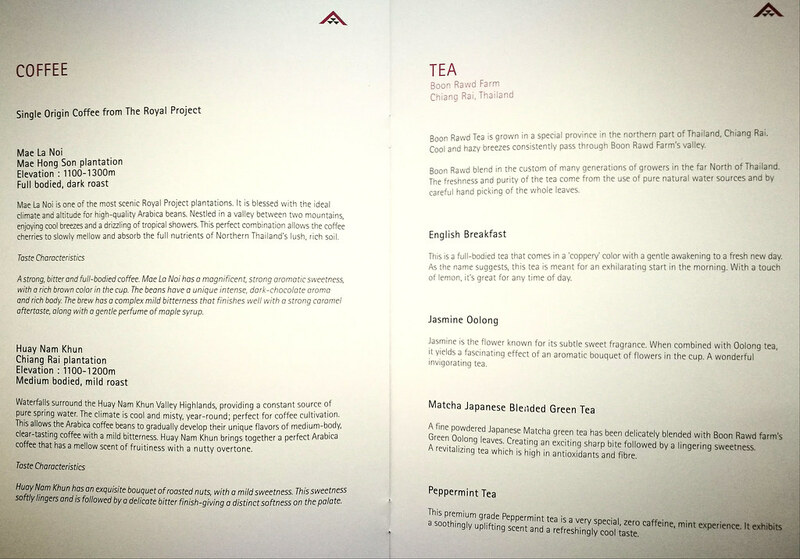 I figured this was just a way to get Business Class passengers to buy up to the inflight internet plan. Steward took meal orders from the A seats down the line and up from K seats. 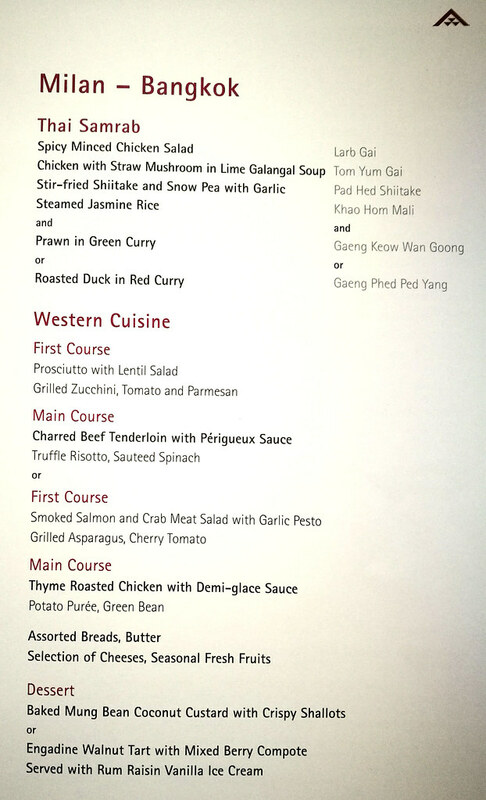 By the time it was my turn the Thai duck meal was no longer available. Thus, I picked the beef from the western choices. 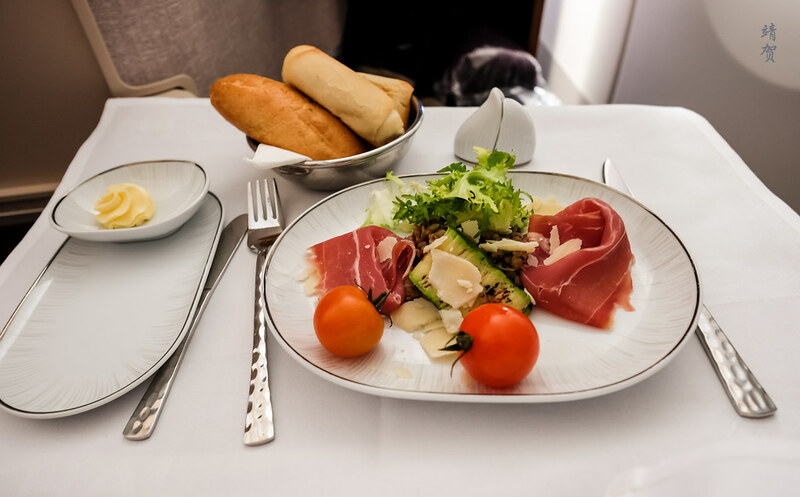 An appetizer of prosciutto was served almost 2 hours after our scheduled departure time and that meant passengers should try to get some snack or light lunch first prior to boarding if they get hungry easily. This starter dish was generous and comes with grilled zucchini, tomatoes and parmesan. A bowl of breads was provided on the table with butter. 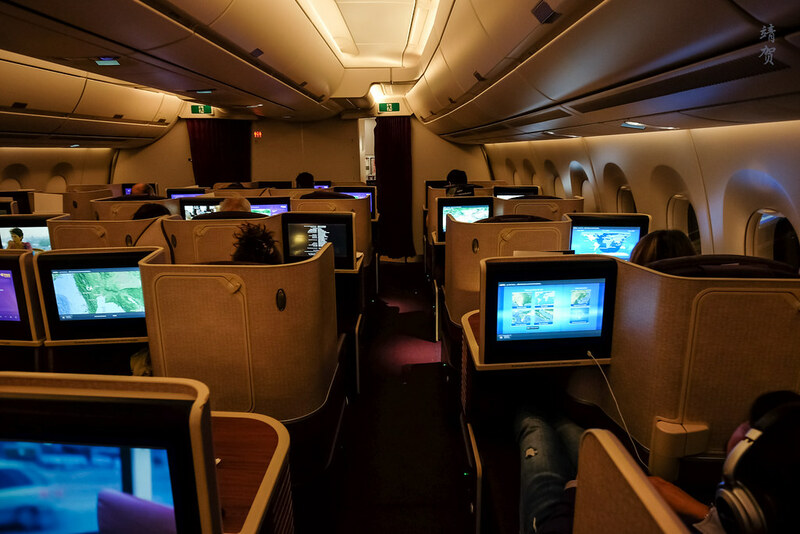 The tray table for Business class passengers is stowed plainly in sight across from the console and was easy to operate and does not intrude on the passenger space when not in use. 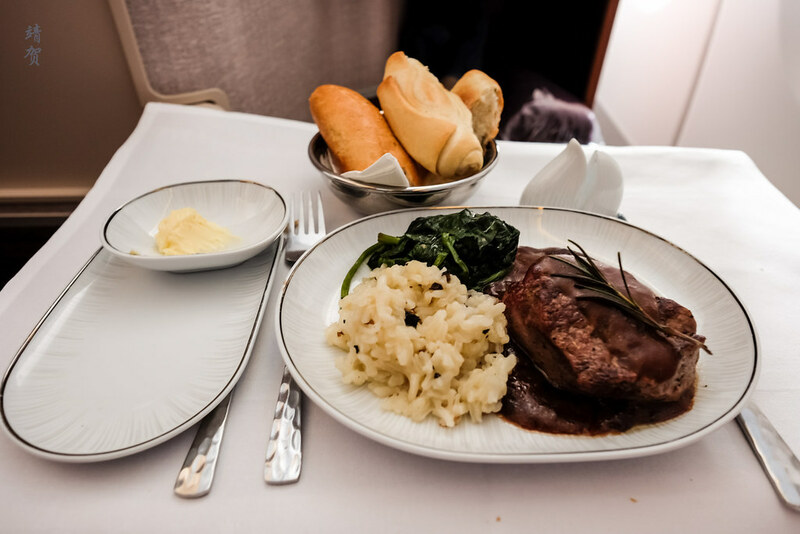 The main course of beef tenderloin was not bad either though I have had better beef main courses on a plane. Side dishes of truffle risotto might seem appetizing but it was disappointing that the risotto was lacking in any flavour coming out of Italy. I was asked after the main course if I would like any cheese. Since I was not yet full, I accepted the offer. 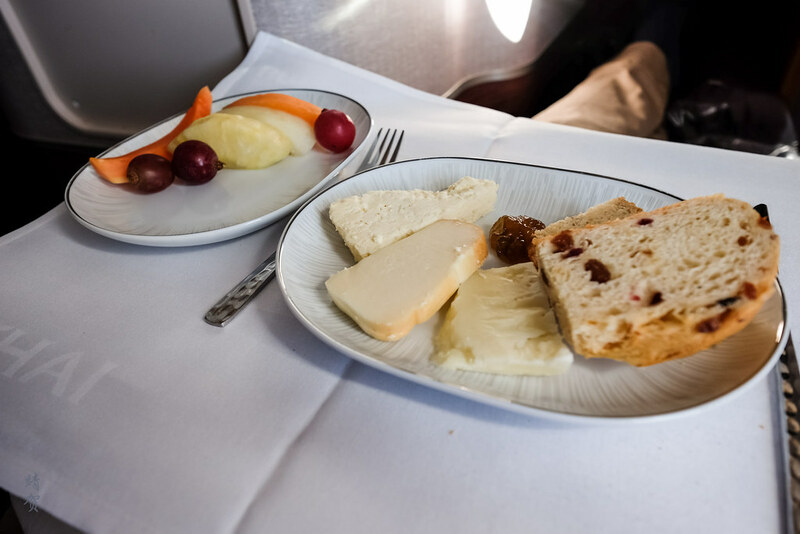 The cheese plate came with some raisin bread and a plate of fruits. 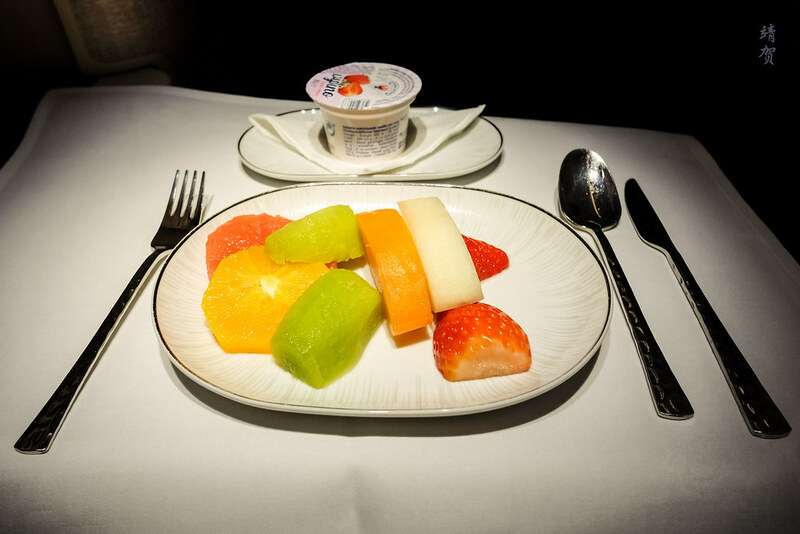 They were both average and acceptable, though the fruit plate could have been more substantial. 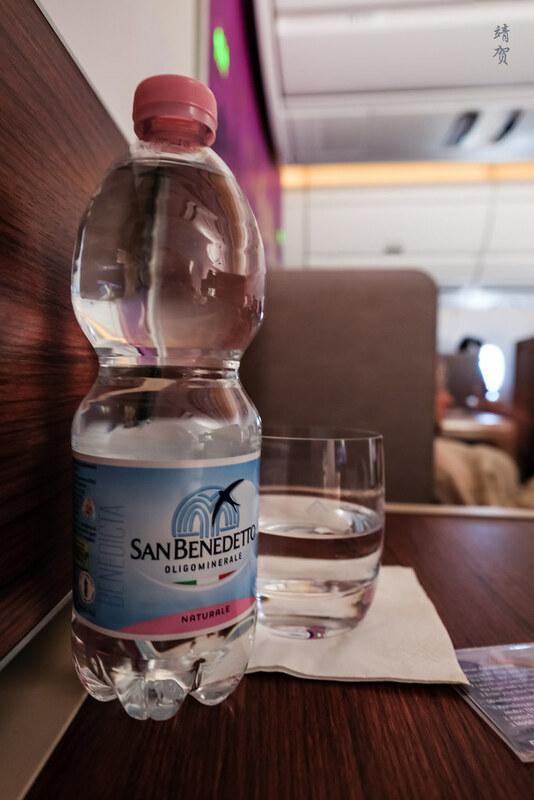 Bottled water was provided for every Business Class passenger after the meal. Throughout the meal service, the crew never asked if I wanted more drinks even after seeing an empty glass. There was no beverage service during the start of meal service either and I had to ask for drinks between the meals, since there was no crew coming around with the trolley. During the flight, I noted the cabin temperature was cool and nice for lounging. 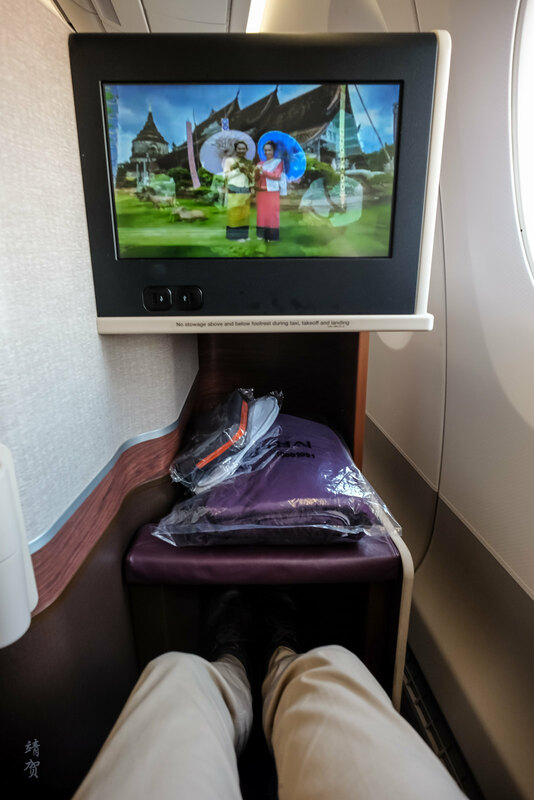 That made for a comfortable flight at least even if the service was not the best. After the meal service, I checked out the lavatory to refresh myself and get ready for a nap. 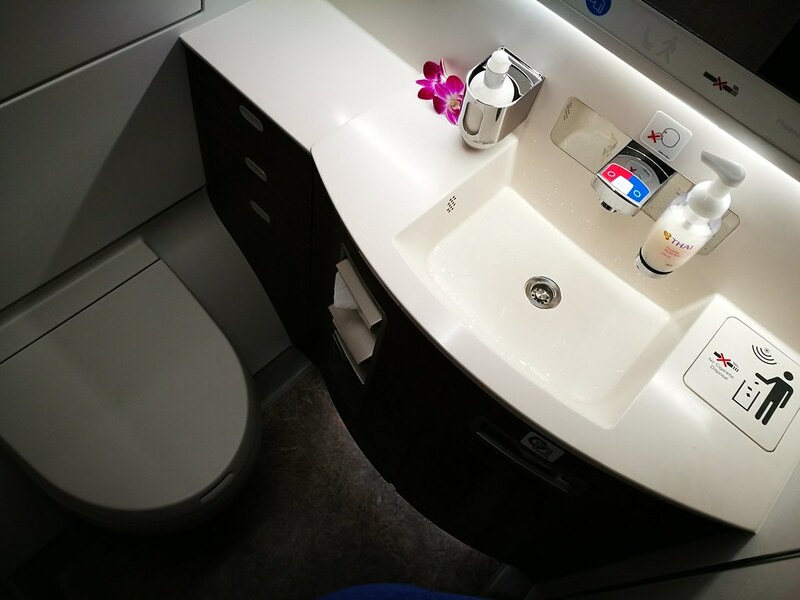 The lavatory was clean and modern but was the same size as those found in Economy. 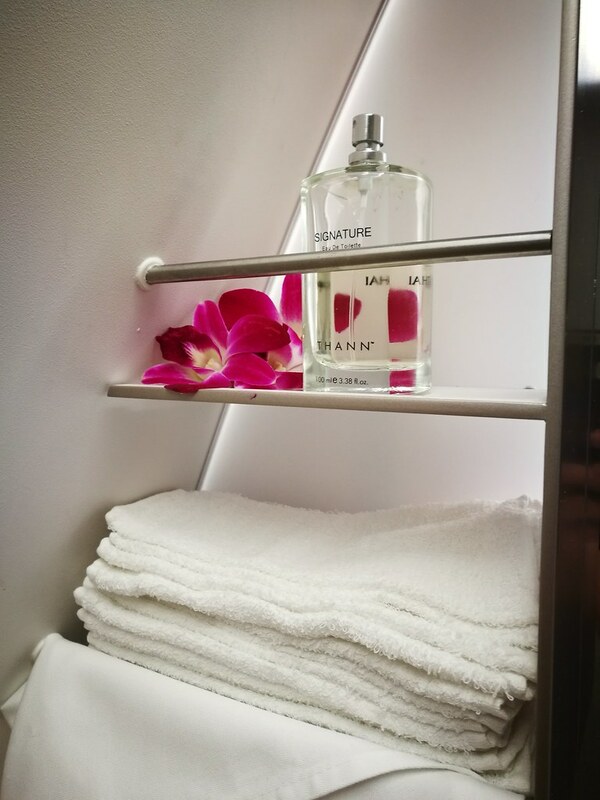 Furthermore, there seems to be a lack of amenities for a premium cabin as the only additional amenity seems to be the Thann cologne on the shelf. Back at the seat, I reclined the seat to a lie-flat mode to get ready for sleep since most of the passengers have closed their windows. A full lie-flat seat with generous footwell space makes it very easy to get comfortable for someone of average height and built. 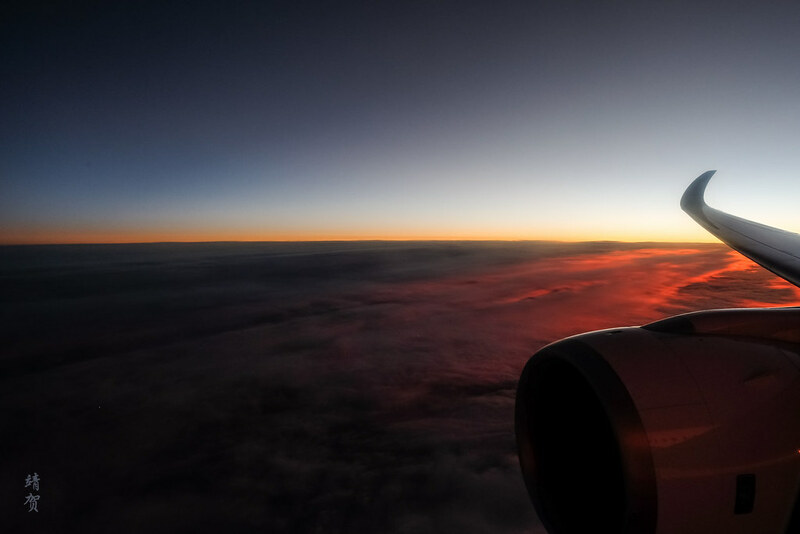 With the day flight, it meant I was not that sleepy yet and thus I entertained myself with the movie selection first and managed to enjoy the sunset as we crossed the Black Sea. 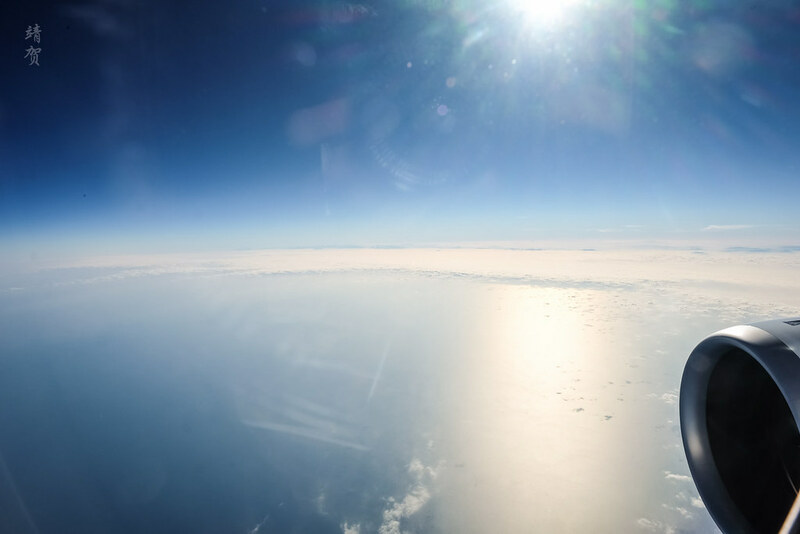 The lack of turbulence made this a pretty uneventful and comfortable flight. I had a short nap shortly after that but it was not easy to get more than 3 hours of sleep before I woke up feeling a bit hungry. Our flight still was around halfway by this time as we were approaching Pakistan. 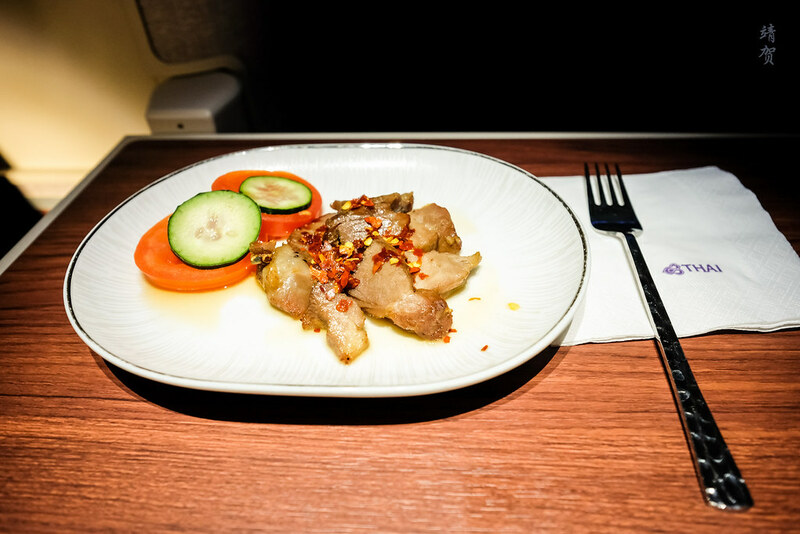 From the snack menu I ordered the grilled pork neck which when heated up gave the cabin a smell of the scent familiar when visiting a Thai street stall. Not sure if it was powerful enough to wake the cabin though. The pork neck was very good and enjoyable as a snack though. In fact I would not have minded more of this and a bit of rice as a main course. As it was a somewhat small portion, I was still a bit hungry and thus chose the shrimp wonton soup this time. It came with a more generous helping of barbecued pork slices at the top and a ramekin of soy sauce and chillies. The soup was tasty as was the dumplings though the barbecued pork was made of lean meat and lacks the fatty portion to make it more enjoyable. Compared to the pork neck, I think I liked the pork neck dish better. After the snack, I tried to go back to sleep but it was not easy to get any more as I did not feel tired. Though the quiet and dim cabin certainly helped with making it conducive for a nap as many passengers seems to have no troubles resting. The smooth flight certainly helped as well! I managed probably an hour or 2 more of sleep before waking up again. At this time, the cabin crew saw me awake and left another hot towel to allow me to freshen up. In addition, she did mention that breakfast service will begin momentarily. About 20 minutes later, the crew came around to ask me if I would like anything to drink and I asked for coffee. The breakfast order was taken at this time as well. 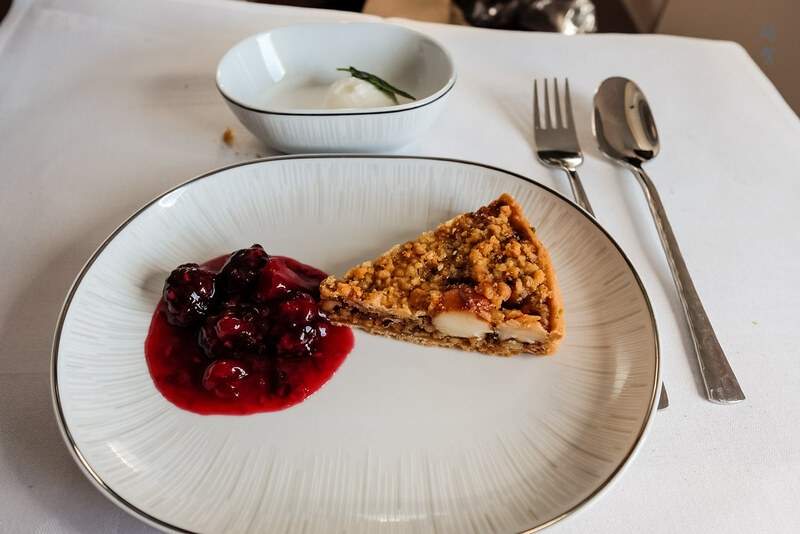 A while later, the crew came around to set up the linens for the tray and serve the fruit plate along with a yogurt. 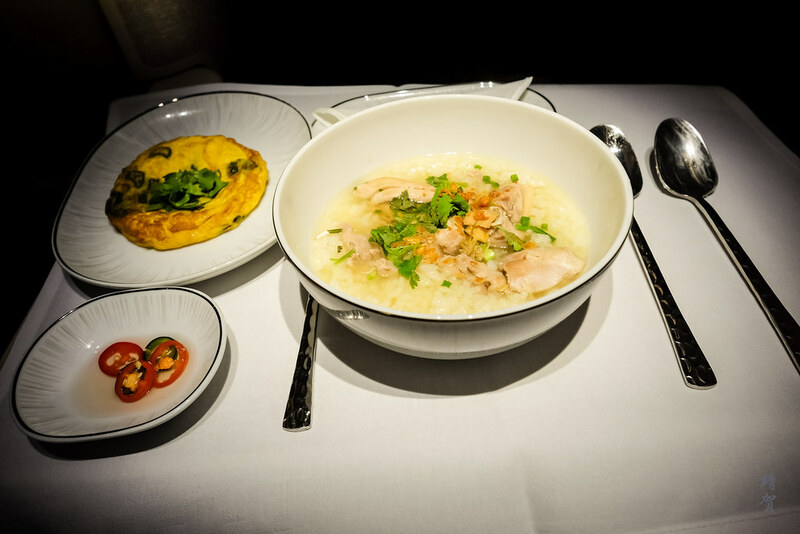 Next came the main course for breakfast and I have chosen to go with the boiled rice with chicken which is more like congee as I expected it to be. Garnished with cilantro and crispy shallots, this is a typical Asian breakfast and it was definitely comfort food for me. The best thing was it came with puffy spring onion omelet, just the way I like it fried when having congee. It was oily and thick making it a good pairing with the plain boiled rice. 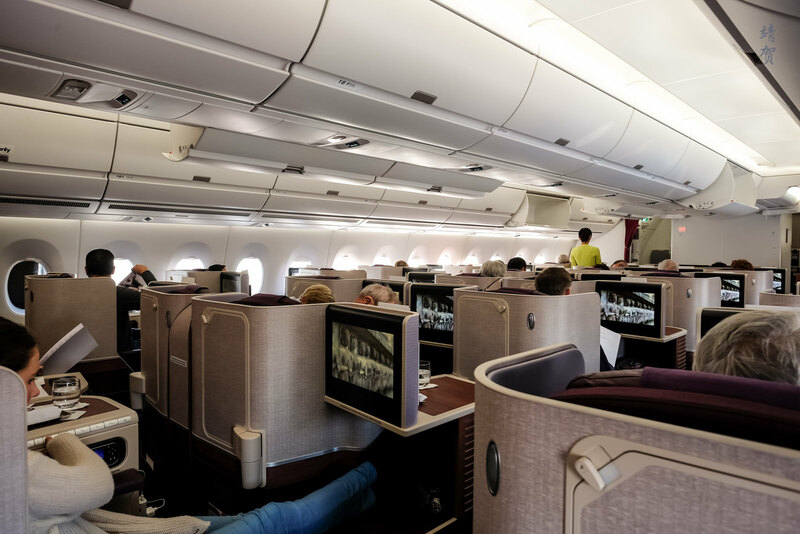 From what I reckon, the Business Class cabin seems less busy during the breakfast service since not everyone was awake for it. That meant a faster service and I was done with breakfast and plenty of time to spare before our arrival. As such, the lights was dimmed the whole time breakfast was served though it was no trouble as there was enough lighting on demand from the seat controls. 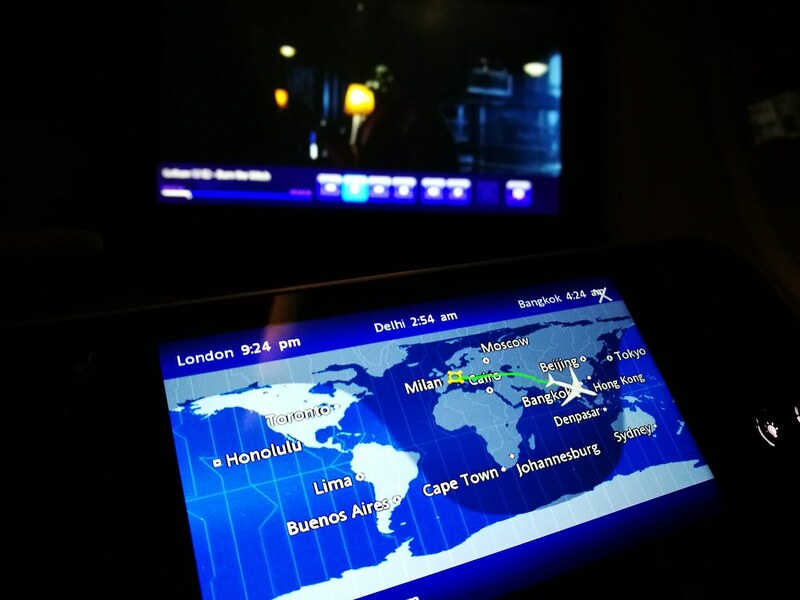 For the rest of my flight, I changed out to my more formal wear from the lounge wear I had brought and continued watching more of the inflight entertainment while taking note of our position on the flight map. By then there was still nearly 2 hours into the flight. 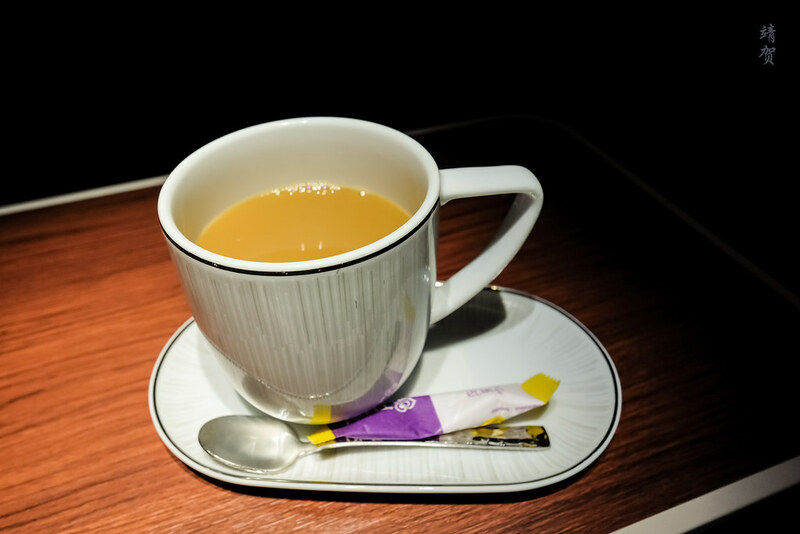 About an hour before our scheduled landing, the cabin lights were slightly brighter as the cabin prepared for descent and the crew started to collect the comforters from passengers to be stowed before landing. It was still possible for passengers to hang on to them though if they needed it. Landing early into Bangkok was a very fast affair since there was not much queue to land and with a direct approach, we were taxiing to the gate in no time. 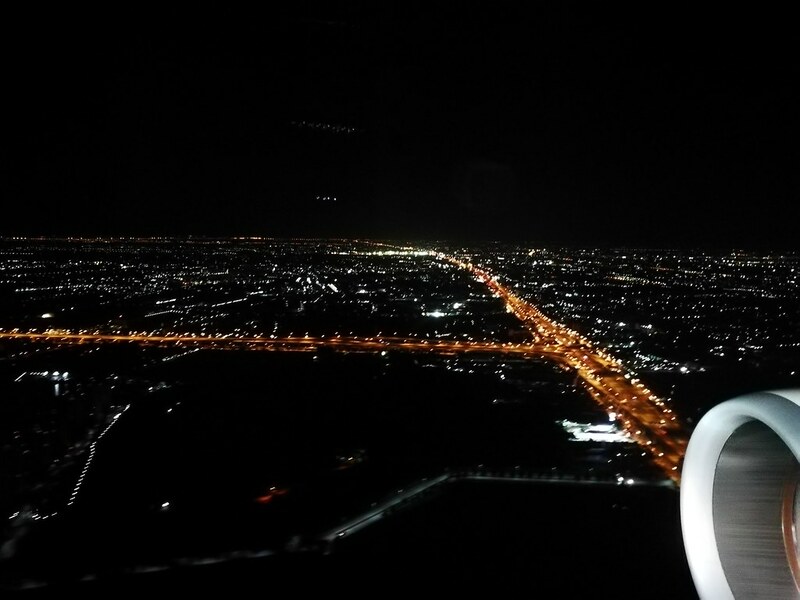 In fact, we landed way earlier than our scheduled arrival and that gave me more time for my transit in Bangkok. 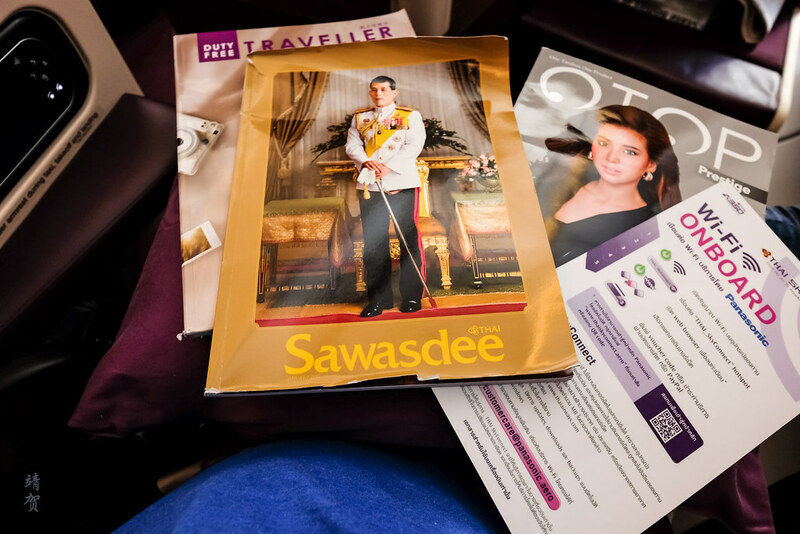 Our fast taxi to the arrival gate made sure I had enough time for a massage an a second breakfast in Thai’s Royal Orchid Spa! 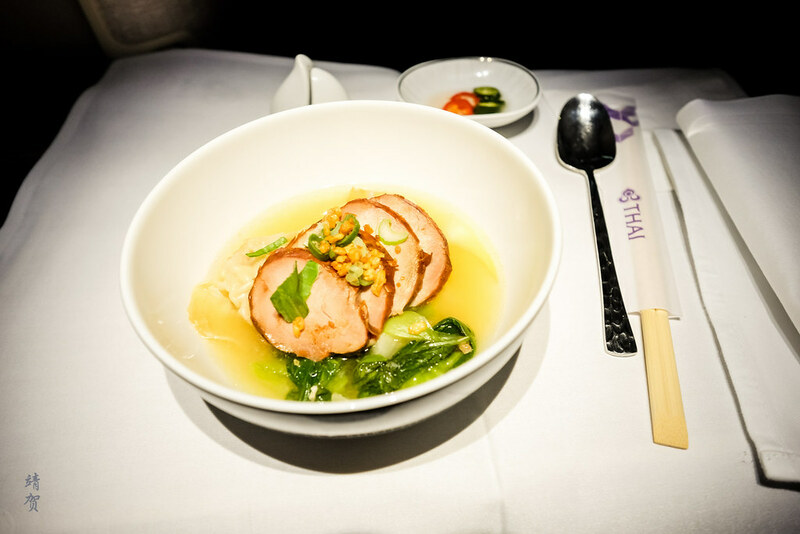 Judging the whole flight, it was a routine Business Class service with a lie-flat seat and more premium food. Service for the flight was the disappointment here as it was slightly below average with call buttons taking a long time before getting the attention of the crew. Trash such as napkins and used cups was just left beside the seat throughout my nap. Even the tables took a while to get cleared after the meal service. Amidst all the slow service, they did get the job done and did their best to satisfy my requests. 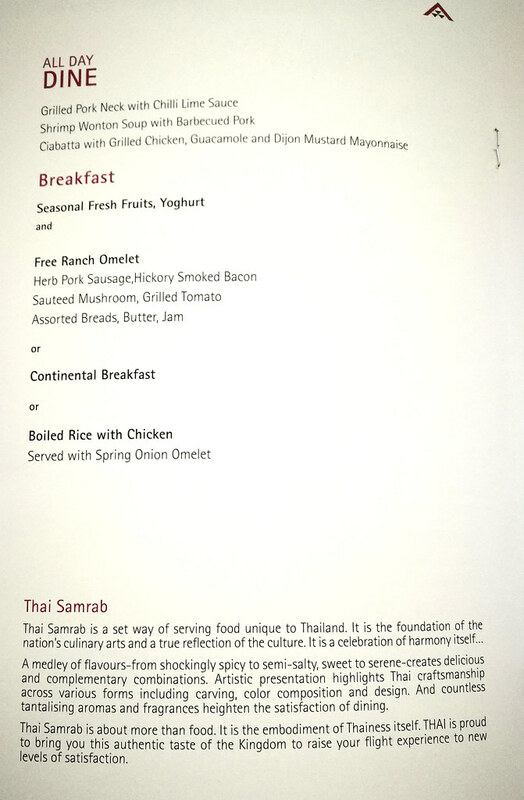 Concluding, Thai’s lower pricing compared to Singapore Airlines or Cathay Pacific would still make me choose them since I enjoyed the cuisine served and the new planes makes it a joy to fly with. In fact I still have a return flight to Europe with them and I hope for a better flight with them!